This is very exciting to observe! 1. Fold the kitchen/paper towel a few times to get a bit of thickness. 2. Lay the kitchen/paper towel on top of the saucer and pour out some vinegar until it is soaked up by the kitchen/paper towel. 3. Place the penny on the kitchen/paper towel and leave it there. 4. Keep a check on the penny and observe the chemical reaction. 5. Leave it for a full day to get the best results. What happened to the penny? It turned green. 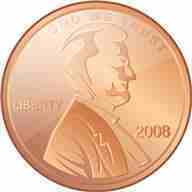 The copper in the penny reacts with the oxygen in the air to form the green colored copper oxide.